In his acclaimed new book, Emory University Distinguished Professor Kevin Young explores the history of hoaxes and fakers, and how they continue to shape our culture. UPDATE: This event has been postponed and will be rescheduled at a later date. Emory University will be closed Jan. 18 due to severe winter weather. 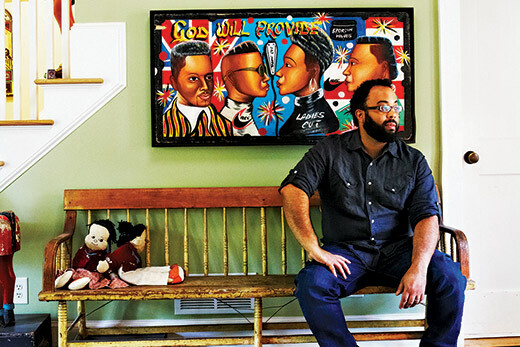 Poet Kevin Young will give a free reading at 4 p.m. Thursday, Jan. 18, in the Jones Room of Emory’s Robert W. Woodruff Library. Young will read from his new nonfiction book, “Bunk: The Rise of Hoaxes, Humbug, Plagiarists, Phonies, Post-Facts, and Fake News.” A book signing will follow. Attendees are asked to register online for the event. Young, who served as curator of literary collections and of the Raymond Danowski Poetry Library at the Rose Library for nine years, is University Distinguished Professor at Emory and the director of the Schomburg Center for Research in Black Culture in Harlem, a research unit of the New York Public Library. He also recently became the poetry editor of The New Yorker. Young is the author of 12 books of poetry and prose, most recently “Blue Laws: Selected & Uncollected Poems 1995-2015” (2016), longlisted for the National Book Award; “Book of Hours” (2014), a finalist for the Kingsley Tufts Poetry Award and winner of the Lenore Marshall Prize for Poetry from the Academy of American Poets; “Ardency: A Chronicle of the Amistad Rebels” (2011), winner of an American Book Award; and “Dear Darkness” (2008). His collection “Jelly Roll: A Blues” (2003) was a finalist for both the National Book Award and the Los Angeles Times Book Prize. “Bunk” was longlisted for the National Book Award and named a New York Times Notable Book, a New York Times Book Review “Editors' Choice” selection, an NPR “Best Book of 2017,” and a Los Angeles Times “Best Book of 2017." Young's previous nonfiction book, “The Grey Album: On the Blackness of Blackness” (2012), won the Graywolf Press Nonfiction Prize and the PEN Open Book Award; it was also a New York Times Notable Book for 2012 and a finalist for the 2013 National Book Critics Circle Award for criticism. He is the editor of eight other collections, most recently “The Collected Poems of Lucille Clifton, 1965-2010” (2012) and “The Hungry Ear: Poems of Food and Drink” (2012). Young was inducted into the American Academy of Arts and Sciences in 2016. The reading is co-sponsored by the Rose Library, Emory College of Arts and Sciences, and the Creative Writing Program at Emory. For disability-related accommodations, please contact Emory Libraries events manager Maya Cody in advance at 404-727-7620 or maya.cody@emory.edu.